A graduate student in the UW’s Gender, Women & Sexuality Studies program, Gonzalez and her band, Quetzal, won the Grammy for best Latin rock, urban or alternative album. The song that gave their album its name, “Imaginaries,” takes its title from “The Decolonial Imaginary: Writing Chicanas into History,” by Emma Perez. Gonzalez’s thesis advisor, Michelle Habell-Pallan, assigned this book in the first course Gonzalez took as a graduate student. The term artivista refers to artist-activists. Gonzalez’s dissertation, “Chican@ Artivistas: East Los Angeles Trenches Transborder Tactics,” focuses on the community of musicians in East Los Angeles who use their music as a social justice tool. As a member of this vibrant, intimate community, she was initially skeptical of attending the UW. “The scariest thing about leaving a tight-knit community is going into an empty space,” she said. And the UW was initially a very empty space for her. Though she was enthusiastic about the department and felt like she had clicked with Habell-Pallan, Gonzalez had reservations. GO-MAP (Graduate Opportunities & Minority Achievement Program) is one such pocket. Juan Guerra, a professor of English and then-director of GO-MAP, persuaded Gonzalez that the UW was the right school for her, after all. Through GO-MAP, she made more “connections like that, one by one.” And Gonzalez ended up creating some safe spaces of her own. 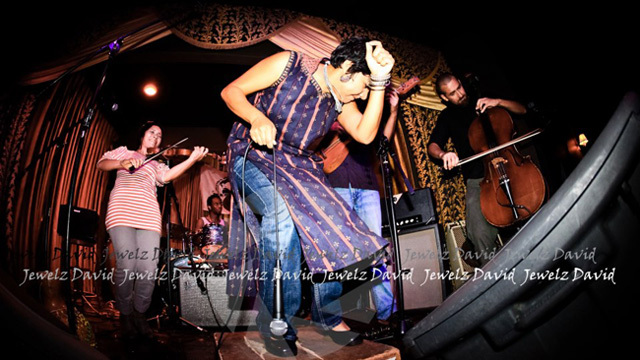 She and her husband, Quetzal Flores, fellow band member and co-founder of Quetzal, established the Seattle Fandango Project, an organization that promotes community through music. She is also a founding member of Women Who Rock, a collaboration of local musicians and scholars and community activists, and a participant in the Women of Color Collective, an organization that promotes and supports diversity through grassroots organizing. Gonzalez seamlessly integrates her own communities of academia and music performance. Her experiences at the UW have reinforced that approach. “Although theoretical discourse often tries to separate itself from practice, my professors have encouraged me to keep relating them to each other,” she said. With her dissertation defense set for May—the last step in earning her doctorate—Gonzalez was able to leverage her music in her search for a faculty position. “Departments are seeing the value in academics who are also practitioners,” she said. And she proved this by recently landing a tenure-track assistant professor position at Scripps College. And while the glitz of the Grammys seems like the antithesis to the formality of academia, Gonzalez has realized that embracing an integrated approach to academia also means embracing her identity as a Grammy winner—especially since it is an attention-grabber. Going forward, Gonzalez expects to continue to be equally devoted to her music and academic study. Want to learn more about Martha’s music and academic research?